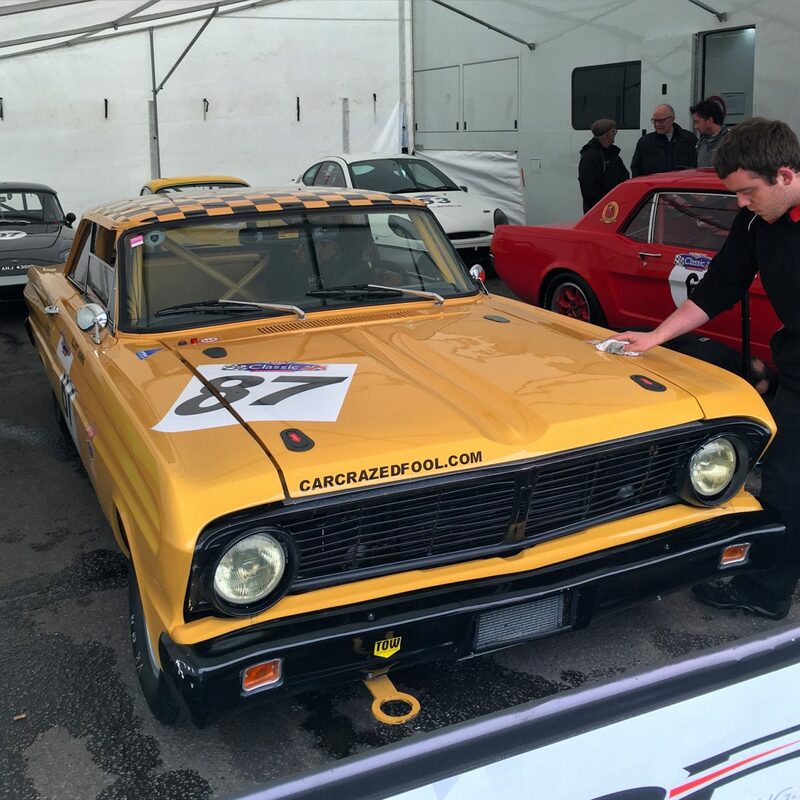 The morning of the first race was apocalyptically cold and wet, more suited to racing a powerboat than an old America V8. However, the weather is just a part of racing, it is England after all. The advantage is, it also sorts the men from the boys, instilling fear in less confident drivers. Heading out for qualifying it was clear the Falcon was going to be a challenge. It was great trying to find a flow, braking early and gently, getting the car turned and on the power as soon as possible, while using the throttle to get it rotated. I had the added disadvantage of being out on the Dunlop M spec vintage tyres. The Swinging ‘60s Championship allows for the use of more modern rubber, but as I was racing in the Classic K (for Appendix K cars) on the Sunday, we took the decision to stick with the historic rubber. Qualification went well, there is never an expectation on the big V8s to out perform the lighter cars like the Lotus Elan in the wet. My main target was the other Ford Falcon. Qualifying in 16th we managed to out place the other Falcon by two positions, who came in at 18th. As the green flag lap began it was clear visibility was going to be an issue. Before the lap had been completed, water was starting to run down the inside of the windscreen. The joy of old cars! As we came round Coram, the pack bunched tighter, poised waiting for lights out. The pit straight came up fast, the lights went out and we were off. Using the edge of the track to navigate the first few corners, I tried to find any reference point, whilst avoiding the other cars. Fortunately, the pack spread out relatively quickly. 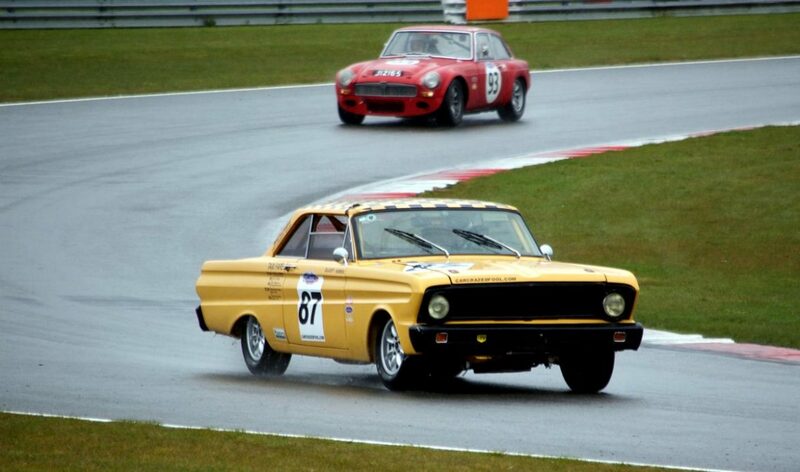 The Falcon proved highly entertaining in the wet, gracefully drifting the hairpins, adding unquestionable style. If only style and ‘cool’ were awarded points. With the race lasting 40 minutes, some cars elect to run as two driver teams, this means they need to have a pit stop to switch drivers. To make it fair for all, single driver cars have to also make a mandatory pit stop. This involves the driver coming in to the pits, switching off the car, undoing the belts, jumping out, closing the door and getting back in as quickly as possible. My pit stop was fast and almost flawless… almost. The team (John Danby Racing), made the call to get me in as soon as the pit window opened. They had a number of cars to manage and as a single driver it makes sense to just get it done. Spotting the pit board, I headed in on the next lap, mentally running through the pitting process; stop, switch off, unbuckle, jump out, shut the door, open the door, jump in, get the car started, buckle up, GO! The “switching off” part was firmly in my mind; during the Dubai 24hr at the beginning of the year I forgot to switch the car off, leaving the wheels rotating and the team at risk of a penalty, something I wasn’t keen to repeat. Rolling down the pit lane, I stopped sharply and the whole process was like a well-oiled machine. The team were slick and pacey. Before I knew it I was off and out on track again; right behind a Safety Car. It couldn’t have played in to our hands better. Just moments after I left the pit lane, they closed the exit. After a lap behind the Safety Car, by sheer fluke and good fortune, I was potentially P1! The pit lane closure, safely car and some poor safety car line up discipline, put me in solid contention for an easy P1 in class and potentially P1 overall. Crazy. However, it wouldn’t have been a fair won victory and karma was going to have a say, during the second lap behind the Safety Car the Falcon ground to a halt. Frustratingly, during my pit stop, in my haste to ensure I did everything correctly, I turned off the fuel pump. Blatant user error, the initial reaction was to blame the car, but video doesn’t lie and the camera footage quickly showed my foolish mistake. It’s not something I’ll do again! Lesson learned. The rest of the race was a game of catch up on a clear track. 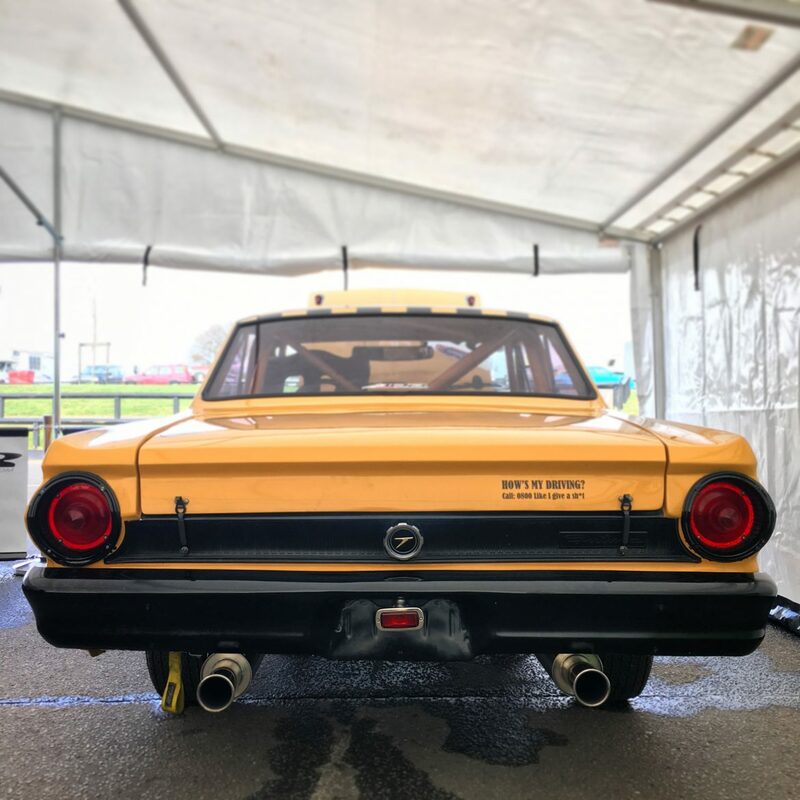 With nothing to lose it was a lot of fun, giving me the chance to explore the limits of the cars handling and putting me in good stead for the Classic K race the following day. What a rush, I love this car!